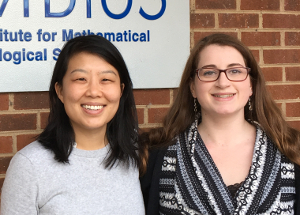 Princeton University doctoral student Sarah Drohan (right) visited NIMBioS postdoctoral fellow Charlotte Chang in January 2018 to develop the hunting model published in Ecological Applications. KNOXVILLE—How many jobs should an applicant consider before accepting the next job offer? Turns out the same decision-making process that goes into searching for a job also applies to hunters searching for prey, and the knowledge can be used in conservation. Just as a job applicant goes through a series of decisions each time a potential job is on the table, so too a hunter faces a series of decisions: shoot and gain a reward or delay and wait for another potential prey. What is the optimal stopping point? Optimal decisions have been used in ecology to address questions about mate or food choice. In this case, an ecologist from the National Institute for Mathematical and Biological Synthesis and a mathematician from Princeton University used it to study hunter diet to determine the optimal stopping point. Mathematically, the decision to shoot yields what the researchers called a "dietary trait threshold" —the point at which a desired trait such as large body mass or antler size is reached and leads the hunter to take a shot. Globally, body size is an important determinant of prey value, the researchers wrote, and so it can help predict which species are threatened by overexploitation. 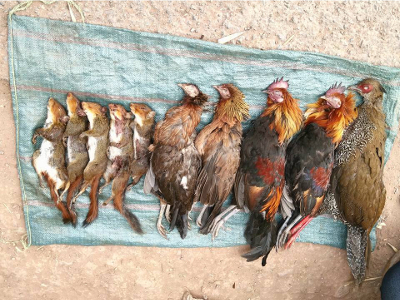 Tropical hunting tends to harvest a wide range of species, across mammals, birds and reptiles. The model is able to identify which ones are subject to hunting pressure. The opportunity cost of each hunting trip is factored in as well. "Being able to evaluate hunter prey selection is critical to prioritizing limited resources for conservation management," said lead author and NIMBioS postdoctoral fellow Charlotte Chang. Chang and co-author Sarah Drohan, a doctoral student in applied mathematics at Princeton University, tested the model using data from the tropical rainforests of Southwest China, a biodiversity hotspot where several species, such as the Gaur and the Green peafowl, are under threat from overhunting. The model could be used to infer whether there had been changes to harvested prey communities and to evaluate the efficacy of hunting regulations. "The model was particularly informative and has the potential to simplify monitoring and management of overharvested areas," Chang said. The study was published in Ecological Applications. The National Institute for Mathematical and Biological Synthesis is an NSF-supported center that brings together researchers from around the world to collaborate across disciplinary boundaries to investigate solutions to basic and applied problems in the life sciences. NIMBioS is supported by the National Science Foundation through NSF Award #DBI-1300426, with additional support from The University of Tennessee, Knoxville.